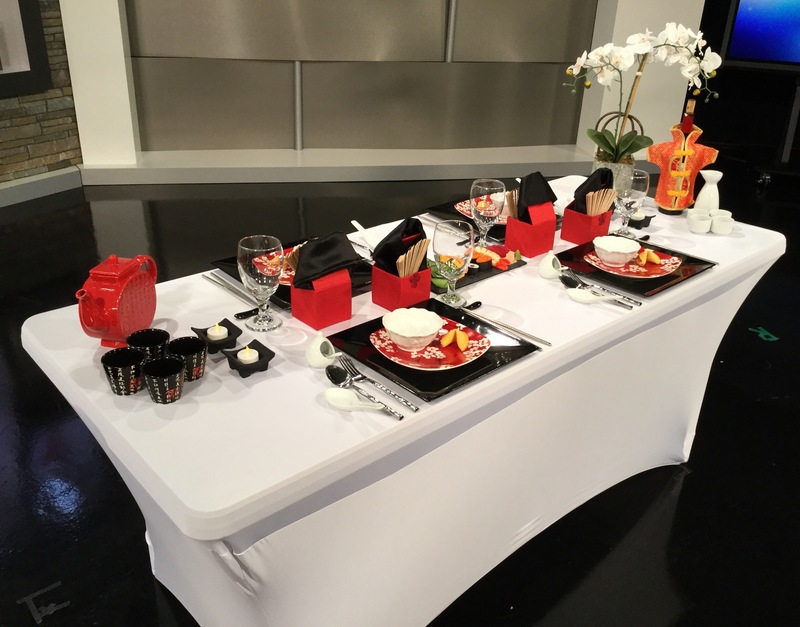 When I set up these demonstration tables on the set, remember…they are probably more narrow than your typical dining room table by about 12″ or so. 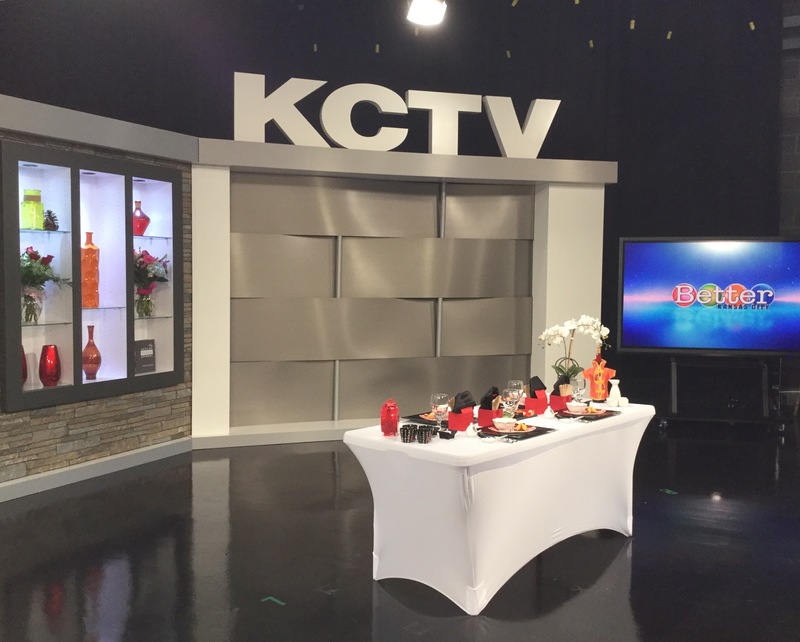 The demo table is 6-ft. in length, but only 30″ wide compared to our 42″ wide dining table at home. That being said, you’d have more center space for food, additional decor, or just blank real estate than what’s shown here. 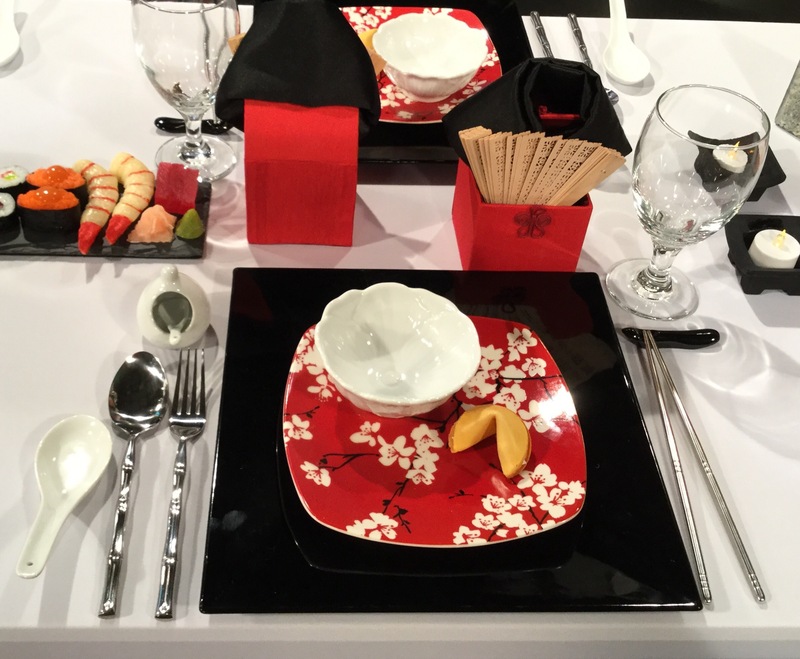 Not everyone is adept at using chopsticks, so as a courtesy to your guests you may want to add flatware such as this faux bamboo stainless. 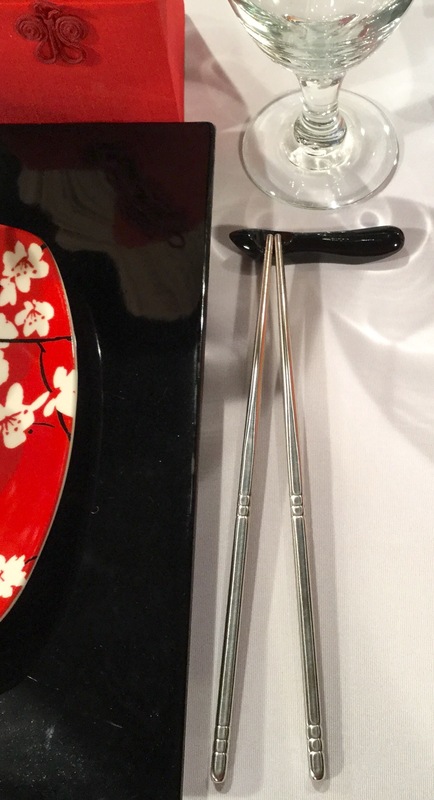 Use the wooden chopsticks typically provided by the restaurant, or consider investing in a pair of permanent ones like these stainless steel beauties resting on a black onyx holder from a local specialty store. 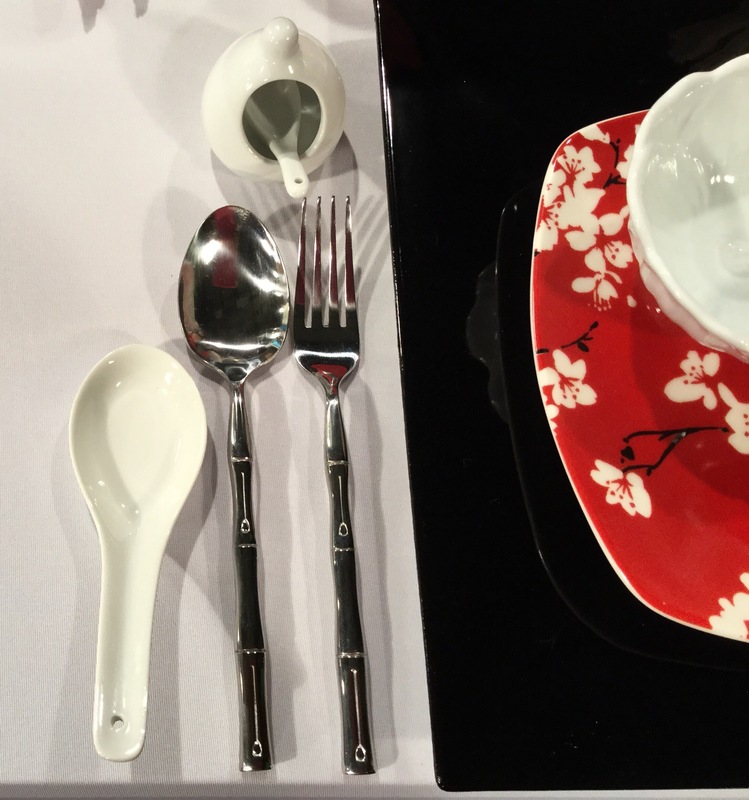 The white miso spoons here are from Pier 1. The “Capri” porcelain spice cellars by Gallery Tabletops are from T.J. Maxx and are great for spices or sauces at individual place settings. 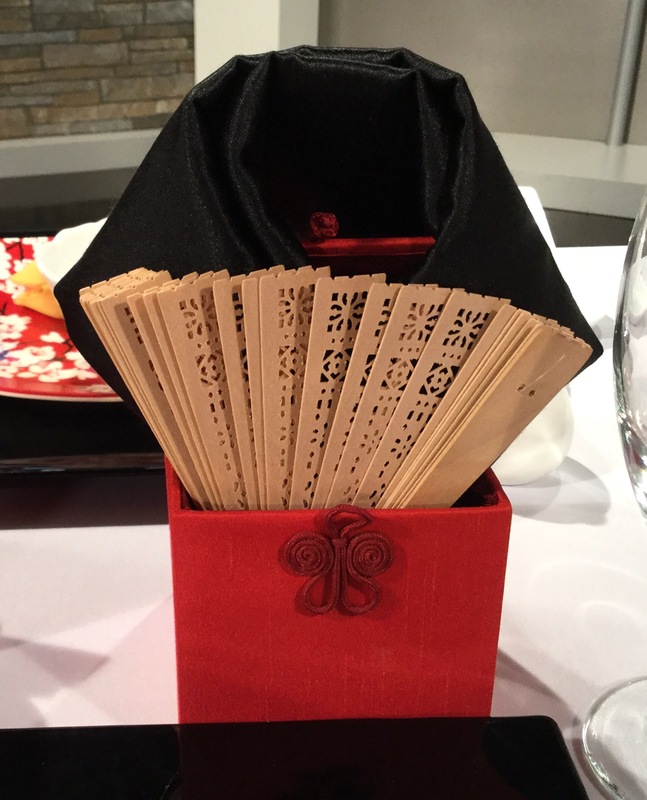 Each place setting has a little something extra in the way the bamboo fan favors and black napkins, folded to resemble a Chinese sash, are presented in a red silk takeout box from Pier 1. 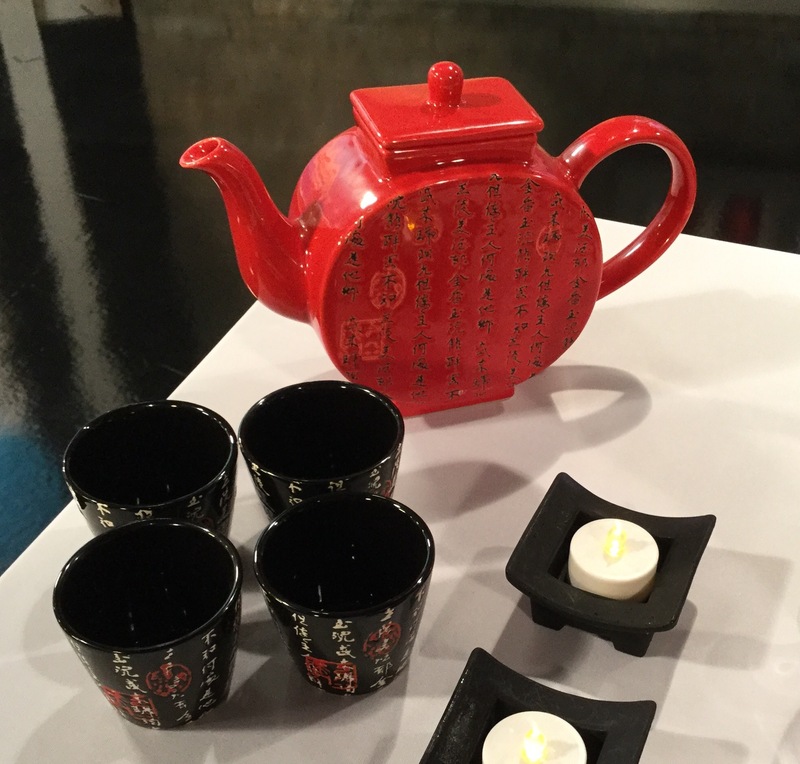 Teapot and cups from World Market. 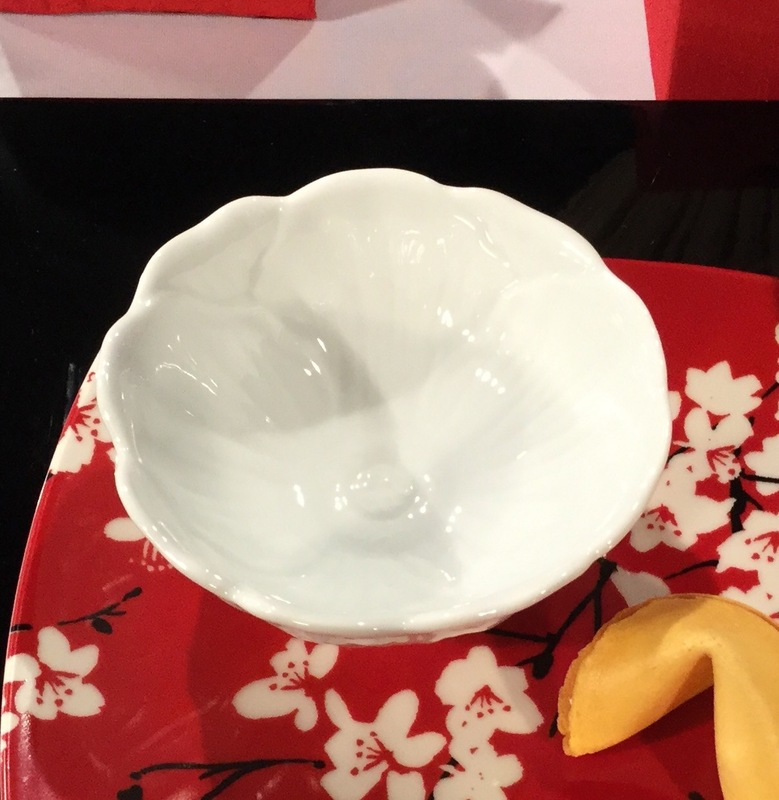 White sake set from World Market. 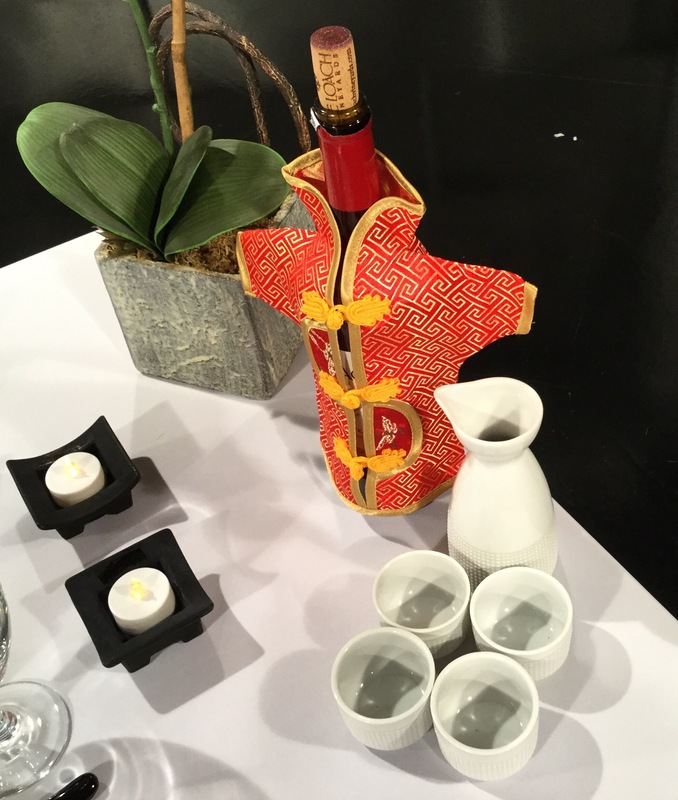 I picked up the Chinese robe wine bottle cover at Tuesday Morning a couple of years ago. 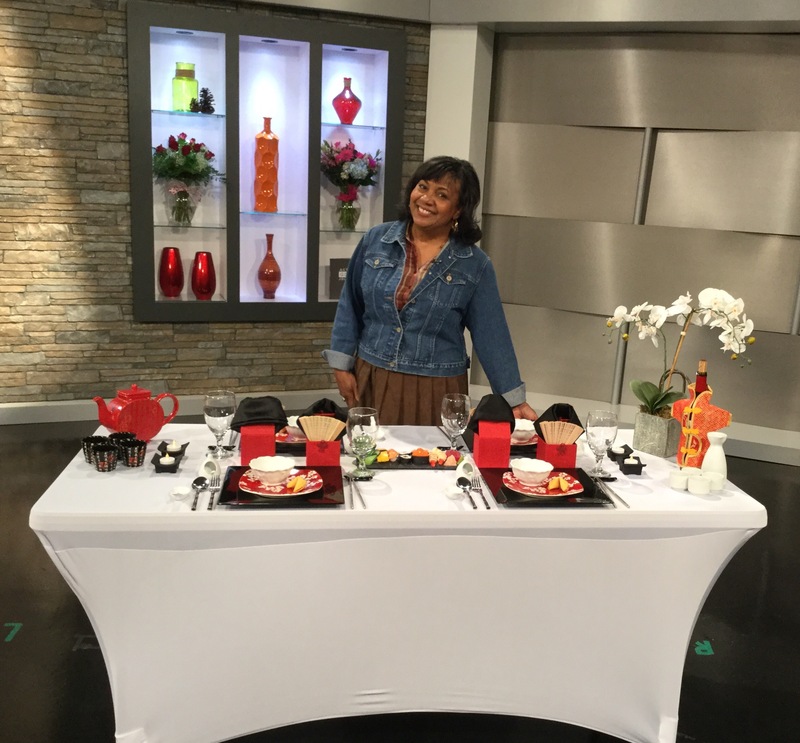 As I pointed out on the show, sometimes food is just so beautiful you might consider using it as a centerpiece. 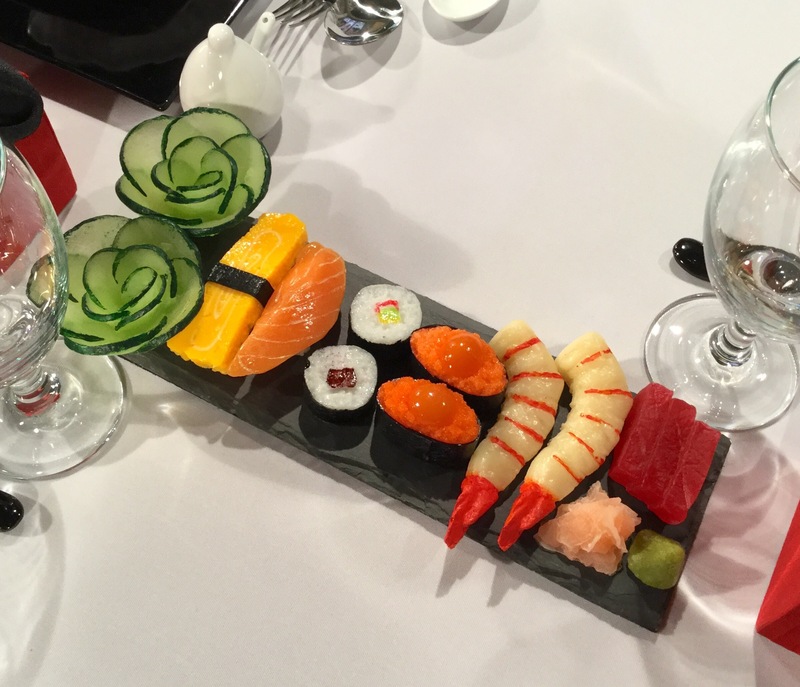 While this sushi is just a pretty good fake for demonstration purposes, it represents the real thing which always abounds in color, form, and texture…perfect elements for a gorgeous centerpiece!